Those who are in favour of ‘ambush marketing’ including the European Sponsorship Association (ESA) argue it’s a perfectly acceptable form of marketing activity for a non-sponsor to be engaged with provided it doesn’t break any ethical Codes of Conduct that may be in place to regulate sales, marketing and communication activities in its territory; that such activities don’t infringe the intellectual property (IP) rights of others or break the law in the territory. Defenders of the practice prefer to call this ‘smart marketing’ where the objective of ‘ambush’ is implied by those who sneer at the practice but may find themselves incapable of doing anything to stop it once it’s taken place. Earlier this year, Red Bull was crowned the ‘King of Ambush Marketing’ for its perceived connection with the 2014 Winter Olympic Games in Sochi. Red Bull already has in place strong links with extreme sports, particularly snow sports thanks to its sponsorship of top athletes including American world champion ski jumper Sarah Hendrickson and Sochi 2014 snowboard cross gold medalist Pierre Vaultier of France. Pepsi isn’t an official FIFA World Cup sponsor but that hasn’t stopped it recruiting some of the most famous footballers on the planet for its ‘Live for Now’ campaign. Pepsi knows that a global TV audience in excess of 1 billion will watch the tournament next month and will be cheering for their heroes including Argentineans Lionel Messi and Sergio Agüero, Englishman Jack Wilshere and Brazilian David Luiz that also make up a 19 man ‘team’ that forms part of Pepsi’s line up. 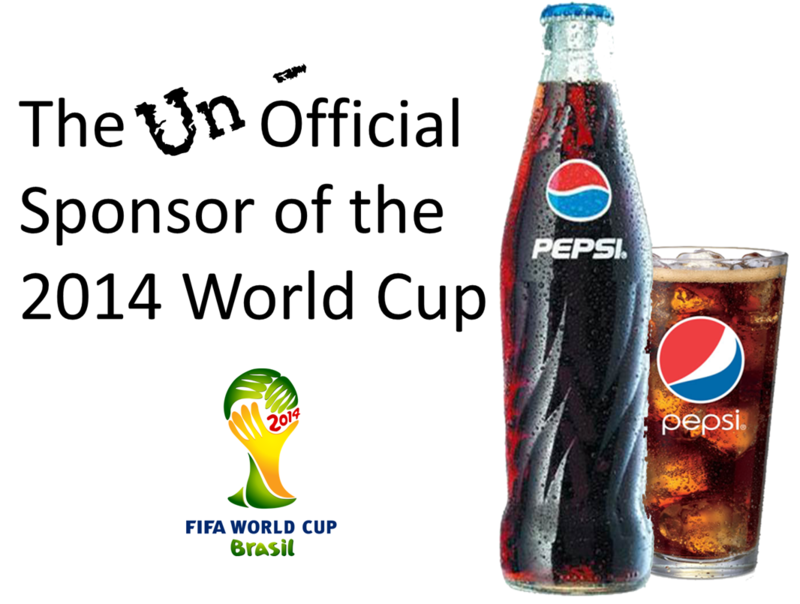 And it’s likely to get away with this cleverly designed ‘ambush’ despite its rival Coca-Cola spending many more millions activating its relationship as global sponsor of the FIFA World Cup Brazil 2014. On the other side of the debate are those who have much to lose from so-called ‘ambush’ marketing activities – event organisers, sports rights holders of events and properties and their official sponsors and partners that have spent a small fortune for the privilege of association with the sponsored event. However, there are also many brands that inadvertently fall foul of the complexities of the law in this area because they mistakenly believe that using imagery around such events is somehow in the public domain and fair game or they believe that as long as they don’t use the official name or logo they’ll be OK.
Others cast an eye on what other brand owners are doing, and simply adopt a similar approach, without appreciating that they’re risking copyright, trademark and other IP infringement claims. The rules that protect the exclusivity of rights around major events, and are used to prevent ambush marketing from rival brand owners are a complex mix of international trademark laws, the tort of passing-off, copyright, design rights, certain specific regulations – such as the Glasgow Commonwealth Games Act 2008 (Games Association Right) Order 2009 – advertising regulations and contract law, for example, in relation to use of tickets for competitions, prizes and promotions. For those brand owners wanting to avoid the risk of legal action, the obvious first step is to become familiar with the laws and regulations in this area as well as review what the rights holders have issued as to what can and can’t be done. Some marketers argue that the examples given by event rights holders go significantly beyond the type of use that they’re legally entitled to control. But nonetheless, it’s the organiser’s stated position and if ‘ambush marketing’ appeals then at least brand owners have a sense of how far they’re able to go before enforcement action is likely to follow. Lawyers love to point out that such advice notes doesn’t carry the force of law as it’s for the court to decide whether there’s a breach of IP rights or not, and this can be a very expensive process both for the litigant and those defending such an action. As with anything in sales and marketing laws, there’s a big grey area that brands need to navigate. For example, what’s the position if brands simply want to reflect what consumers are talking about on social media – such as if Pepsi brand ambassador Jack Wilshire scores a goal in England’s first match against Italy, Chris Froome wins the Tour De France and Mo Farah shows off the Mobot at the Commonwealth Games? Rival non-sponsor brand owners are unlikely to sit on the side-lines, are they? They’ll want to engage in conversations on Twitter and other social media sites but this doesn’t necessarily amount to infringement. Whether these and other ‘ambush marketing’ activities are actionable in law will depend on a number of factors that include what rights the event organiser has protected; the identity and attitude of the official sponsors; how the advertising differs from what the ambush marketer normally does; and whether consumers are being deliberately duped into believing that the advertiser is an official sponsor when patently it’s not. Ambush marketing isn’t for the feint-hearted and the vast majority of brands will want to ‘play it safe’ by not running the risk of a legal action. On the other hand there will be brands that will like to ‘sail close to the wind’ and will use words or images that may create an association with or be viewed as false endorsement of the FIFA World Cup, Tour de France, Commonwealth Games and the Wimbledon Championships. In such cases, this could turn out to be a very expensive game of chance.